I’m always bemused by the reaction I get when someone discovers my distaste for fruits and vegetables. It’s like, Wait – don’t you have a food blog? Aren’t you a foodie? Aren’t I always seeing your pictures of this or that delicious food on Instagram? Yes, I have a food blog – and it is mostly filled with things like Biscoff Muddy Buddies, doughnuts topped with sugary cereal and potato chip cookies. Just to name a few. Though they’re there, you’d really have to do some digging to find a fresh fruit or vegetable (and the former is probably in a cookie, while the latter is FOR SURE roasted). And I’m okay with that. A foodie? I’d have to say, no. According to Merriam-Webster, a foodie is “a person who enjoys and cares about food very much”. And I would define “food” as more in the savory category – which holds much less interest for me than sweets and treats. And as for Instagram? Let’s be real. I mean, just TRY to find a carrot. Go on, I dare you. Now ALL that said, I do make a home cooked dinner most nights, and am committed – through this series – to sharing easy, doable and family friendly recipes to encourage more people to do the same. I was quite smitten with that roasted vegetable lasagna I made a while back and thought it would be fun to challenge myself – even if only occasionally – with making a meatless meal that was legit delicious. If you’re looking for a blog that is FILLED with easy, budget-friendly and delicious recipes, look no further than Erin at Well Plated. As soon as I saw this dish I knew it was going to be a keeper, and it didn’t disappoint. Let’s start with how easy this dish is. It requires minimal prep, and though the cooking time is long it is almost completely hands-off – making it a godsend for busy weeknights. If you enjoyed my quinoa series from a while back you may have a bag or two in your freezer, saving even more time here. 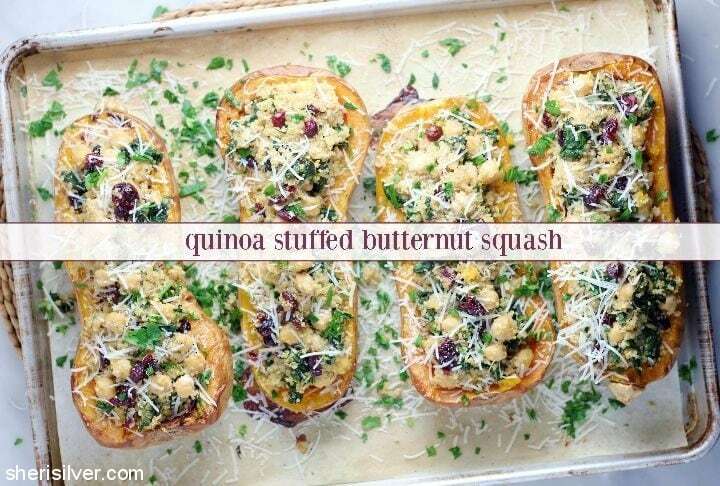 I also love the versatility of this recipe. I made it according to Erin’s original instructions, but I could easily see swapping the quinoa for brown rice or the kale for spinach, and adding some toasted walnuts for additional crunch. But most importantly, we all agreed that this was one delicious dinner. It was filling and satisfying and the fact that it was meatless and chock full of vegetables was a win-win all around. Do you have a favorite “Meatless Monday” meal? Share it here – I could clearly use some help! Pre-heat oven to 425 degrees – line a baking sheet with parchment paper. 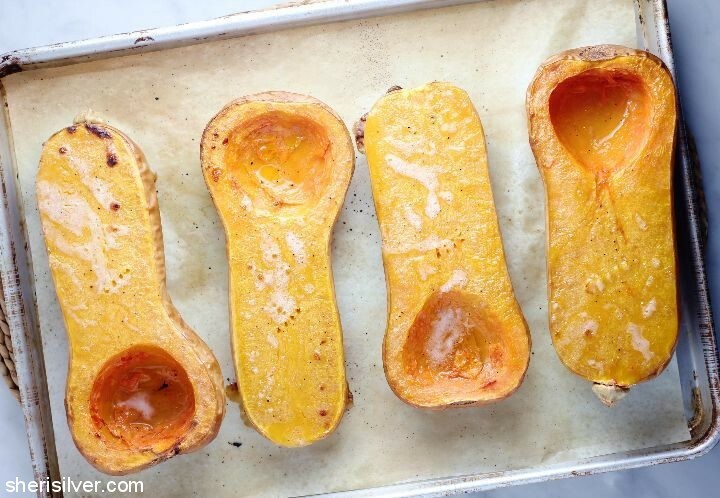 Place the squash halves, cut side up, on your baking sheet. Drizzle with 1 teaspoon olive oil and season with salt and pepper. Bake till fork-tender, 45 – 60 minutes. Remove from oven and let cool; reduce oven temperature to 375 degrees. While the squash is baking, bring the broth to a boil in a small saucepan. Add the quinoa, return to a boil, then reduce heat and cover. Simmer for 12 minutes. Remove from heat and let sit, covered, for 15 minutes. Fluff with a fork. Heat the remaining teaspoon olive oil in a large skillet over medium heat. Add the kale and cook till wilted. Reduce heat to medium-low and add the garlic, oregano and salt and pepper to taste. Cook for 30 seconds and add the chickpeas, orange zest and juice, cooked quinoa and cranberries. When squash is cool enough to handle, scoop out the flesh, leaving a border around the sides and bottoms. You can reserve the flesh for another use or mix it in with the filling. 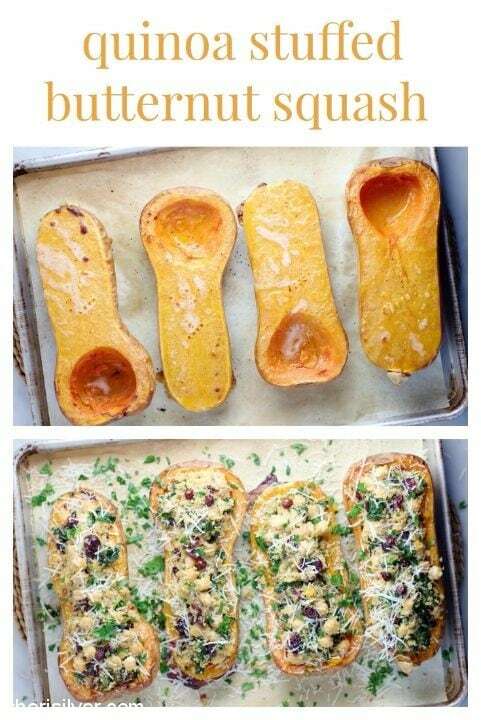 Scoop the filling into the squash and bake till hot, about 10 minutes. 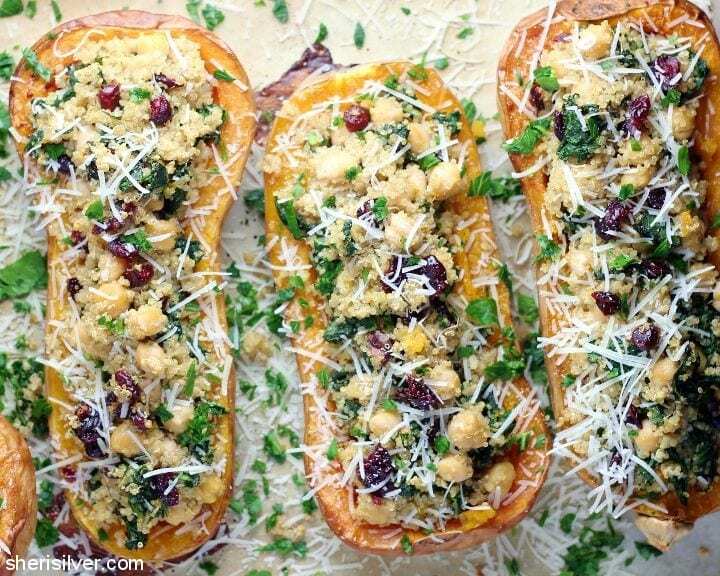 Sprinkle with cheese and chopped parsley (if using) and serve immediately. Get more “dinner in real life” recipes on my Pinterest board! 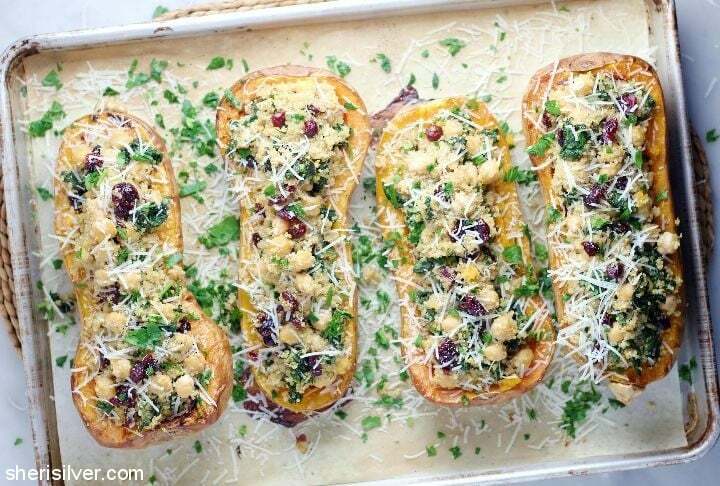 I love quinoa stuffed butternut squash recipe. I need to add bell peppers to recipe and it would be perfect. Thanks for sharing! Wow. This quinoa stuffed butternut squash looks is a pure combination of taste, I love healthy food.